In our previous blog post here on Guitarz we were looking at a Jolana Disco bass that had its body shape modified and cut down to size by a previous owner. That, in effect, is what has happened to the guitar we are looking at today, although in this instance the cutting down to size happened in the factory where it was built. 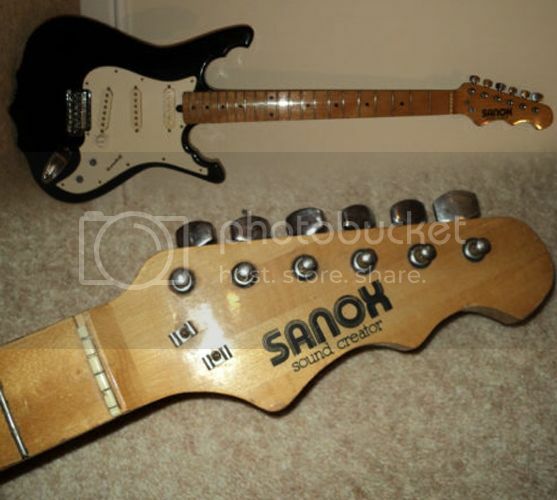 Even with the modifications and the almost "monkey grip" body horns, there's little disguising the fact that this Sanox Sound Creator has been based on the world's most copied guitar, the Stratocaster. If anyone out there can shed any light or has any concrete information on the Japanese brand "Sanox Sound Creator", please get in touch, as I would love to find out more and there is a dearth of information about this brand on the internet. In fact, most of the references you will find in a Google search will be about my own see-thru Sanox Sound Creator acrylic-bodied Strat that I purchased from an eBay seller in Germany back in 2005 (and that is all I know about it). These guitars do not come up for sale very often which would imply that the brand was short-lived. The example seen here is currently listed on eBay UK with a Buy It Now price of £225 which, I think, may be a tad optimistic seeing as - from what I can make out in the photos - it doesn't appear to be in the best of condition. The nut is broken, the tone knobs are missing (possibly the pots themselves, it's hard to tell), one of the tuners is missing its rear cover, and as it is pictured without strings I have to wonder how long it has been stored like that and what condition the neck might be in now. It definitely would need a good setting up.